Hardware manufacturer BioStar has this week unveiled a new addition to its range of motherboard components with the unveiling of the TB250-BTC PRO Motherboard which comes equipped with 12 Slots. 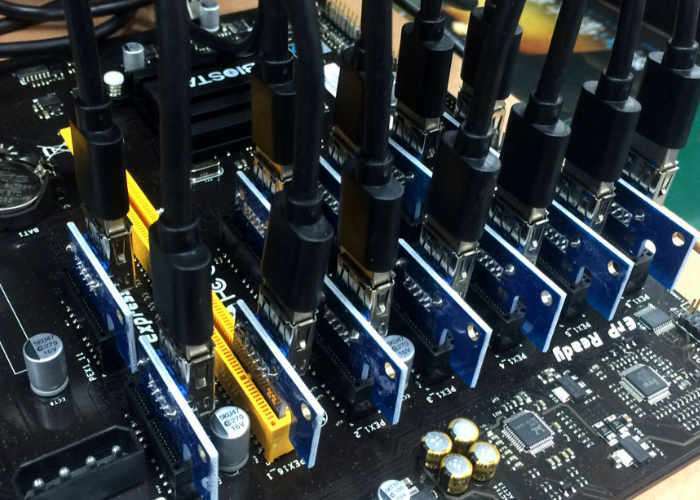 If you are engaging in Cryptocurrency mining the TB250-BTC PRO Motherboard might well be worth considering as the new motherboard is the first to support up to 12 graphics cards simultaneously for $129.99. The World’s First 12 GPU Mining Motherboard Now Available – The BIOSTAR TB250-BTC PRO is the only motherboard equipped with 12 native PCI-E slots and supports both AMD and NVIDIA graphics cards for mining. Standard motherboards have an average of 6 PCI-E slots but the BIOSTAR TB250-BTC PRO doubles that allowing up to 12 cards to be used in tandem for twice the speed and twice the board utilization allowing 200% increase in achieving your ROI. The BIOSTAR TB250-BTC PRO is the only one of its kind allowing 12-GPU mining per motherboard making it the most ideal choice for mining enthusiasts to start making money on. Double Your Earnings, Increase Utilization – BIOSTAR have been taking feedback from mining professionals and have included their ideas into creating these products and with the BIOSTAR TB250-BTC PRO, the universal need to reduce platform cost has been addressed. With a single motherboard earning as much as two machines, a mining rig equipped with a BIOSTAR TB250-BTC PRO and populated with 12-cards is the most cost-effective and smart way to maximize each mining rig’s profitability. The chart below shows the savings of using a single motherboard which only requires one set of components rather than two, thus saving up to US$200 in the initial platform cost. Twice the Speed, Get your ROI 200% Faster – With 12 GPUs working simultaneously on the BIOSTAR TB250-BTC PRO, this allows miners to rapidly gain their ROI faster than conventional setups. Possible rigs include 2-speed machines featuring GPUs from both AMD and NVIDIA allowing combined performance to provide miners with the ability to quickly adjust to the most profiitable virtual currency they want. See chart below for a quick comparison which shows the combined hashrate offered by a single platform powered by the BIOSTAR TB250-BTC PRO versus two rigs running different GPUs. The mining rig running TB250-BTC PRO receives a return of investment (ROI) in only 79 days versus 97 days for the separate systems. Professional circuit board design for optimal mining stability – Other brands implement tight and compact arrays for their PCI-e slots making them easy to short circuit and affect stability during maintenance as well as other faults like displays not being recognized. The BIOSTAR TB250-BTC PRO uses a matrix arrangment for the PCI-E slots allowing optimal and ample spacing between the slots for effective management as well as layout so each daughter card connection does not interfere with its neighboring slots. This results in more stable signals to and from the board and the devices connected to the slots. BIOSTAR also utilizes their signature PRO Series standards on the TB250-BTC PRO utilizing an all-solid capacitor setup and a rigid power management module, ensuring highly stable power delivery and operation even with 12 cards running simultaneously. Native PCI-E for Maximum Bandwidth – We all know that the information bandwidth is like the highway, the road wider, can accommodate the more traffic, the more vehicles that won’t be hammed and can pass through. Other manufacturers utilize low-level chipset bridge thus providing a narrow passage to the graphics card being used, affecting overall system performance due to bottlenecking of each graphics card.